Newton D’Souza, PhD. is an Assistant Professor in the Department of Architectural Studies at the University of Missouri-Coulumbia and is the Primary Investigator on this project. Tilanka Chandrasekera is Doctoral Student and Research Assistant in the same department. Phase 1: Creation of an exploratory virtual reality interface that allows working on multiple skills in design. Phase 2: Pilot testing the interface by incorporating students. Phase 3: Exploring the validity of the tool in fostering multiple skills. In phase 1 of the project, a storyboard of design exercises relevant to specific skills was developed. 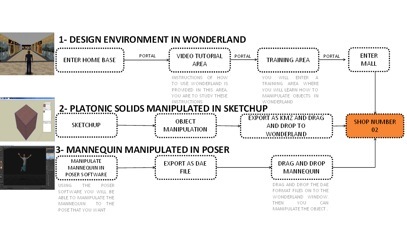 The collaborative virtual environment, Open Wonderland was then used to translate the storyboard into a design exercise. 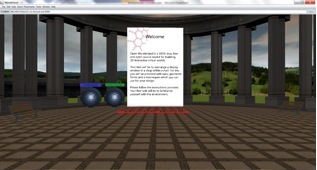 The Wonderland virtual environment is a distributed, persistent, virtual space in which people can interact with each other using an avatar controlled by the mouse or keyboard. A designer can chose to design three dimensional forms and directly import them to the Wonderland environment. One student from the Department of Architectural Studies and one from the Department of Textile and Apparel Management were invited to participate in design exercises. These students were self-selected based on an announcement by the researcher to participate. The students participated voluntarily and both were female in the age range of 18-25. Mixed methods were used in this study. First we used the Torrents Test of Creative Thinking to measure overall skills prior to the design problem. We then conducted a qualitative virtual reality interface interview to measure skills that would be needed to solve the design problem. Later, the results of the two tests were compared to see which skills were reinforced and which skills were diminished. The design problem involved re-arranging a shop window display in a shopping mall. We wanted the design problem to simulate a physical studio design problem, but at a decreased level of difficulty. This was to avoid making the design problem a formal logic test (eg, puzzle solving or missing object identification) that architecture schools administer in admissions testing that may not reflect the reality of university-based architectural education. Instead, the design problem emphasis was on context, user-behavior, material, and spatial and logical iterations. 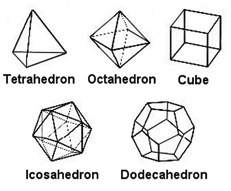 The subjects were to design a display window for a shop within a mall using five types of platonic solids (see illustration below) and virtual mannequins. They needed to consider factors such as visual appeal, location of the shop, different exits and entrances, other stores, and so forth. Specific details were provided to subjects to narrow the scope of design. For the purpose of storyline, the shop was named 37 North and the subjects were informed that it was a unisex jeans store. The subjects were further informed that the shop was flanked by a gent’s shoe store and a women’s apparel store. There were two exits from the lobby: one to the east which exits to the east wing of the building, and one to the west which exits to the west wing of the building, both eventually leading to two parking lots. 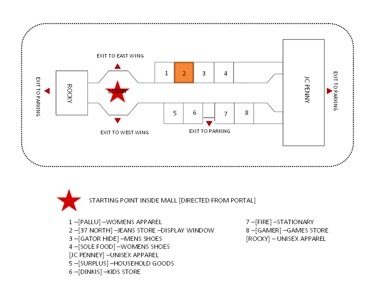 There were also exits to the outside (parking lots) from the JC Penny store and the Rocky store located on the two ends of the corridor. An additional exit to the parking lot was located in front of shop number 03. 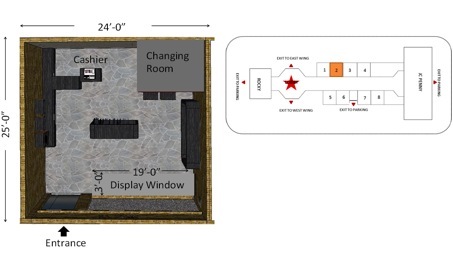 Although the subjects were to take into consideration the context, they were instructed to only use the show window display area (19’X 3’) for the design and not focus on the interior of the shop. 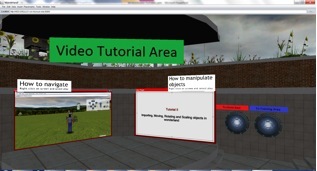 Inside the collaborative virtual environment of Wonderland, the subjects were provided with instructions on how to use the environment through video tutorials which provided information on how to move around the Wonderland environment and how to manipulate solid objects inside Wonderland. They were also provided with training sessions where they try moving, rotating, and resizing solid objects. 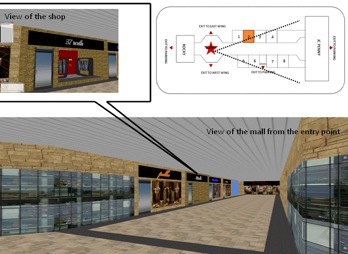 The subjects were only allowed to enter the virtual mall after completing the tutorials and training sessions. Once the subjects were familiar and comfortable with the Wonderland environment, they made their way to the SketchUp software which they used to manipulate the platonic solid objects. We modified the SketchUp interface to limit the options available to the subjects. The main purpose of doing this was to narrow the design space and limit the number of design decisions that the subjects had to make. This helped to frame the design solution more clearly. The subjects were provided with only three types of material: a rigid material with a grid and solid forms, a material with organic patterns, and a solid color patch. They were allowed to change the color hues, opacity, and scale of the material. Once they were satisfied with the material and the overall look of their 3D object, they were instructed to export the file as a .KMZ (Google earth format) and drag and drop it into the Wonderland window where they wanted the object to appear. Once the object was inside Wonderland, they were able to move, rotate and re-size it. The next phase involved using the Poser software to manipulate a mannequin. The subjects were provided with a basic male mannequin model which they could use to portray different poses. 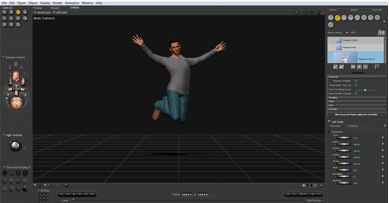 After they manipulated the model within the Poser software, they were instructed to export it as a .DAE file and then drag and drop it in to the Wonderland window where they wanted the mannequin to appear. Once the mannequin was inside Wonderland, they were then able to move, rotate and re-size it. As mentioned above, the students were instructed to create a window display for a jeans store. They came up with the concept “hanging out in out jeans.” In keeping with this theme, they hung the mannequins from the ceiling of the mall. Given that there was also a seasonal dimension, they added geometric objects with Christmas colors to create a 3D pattern in between the mannequins. We have not yet analyzed the data completely yet, however, we did find it interesting that Wonderland provided a fertile ground for collaboration between students in two different fields. In general, student feedback was very positive. They loved working in such an environment and they mentioned that it might be even more useful if we tested it out with them being in different locations. When they were asked what they thought should be improved, they mentioned the displacement in the models when the models were imported. There was one major hiccup that we encountered. Our screen capture software crashed and we were not able to get the screen capture data. Since we separately were recording the screen through additional video cameras, however, we were able to code the actions of the subjects. There were no issues with the Wonderland interface, since we gave our subjects ample training before starting. As mentioned earlier, imported objects did not appear in the place that students expected them to, so that was a cause of frustration. We’re not sure of the root cause of this problem. It may have had something to do with the Sketchup and Poser models that we used. Going forward, we will complete the data analysis and we will use Wonderland again for phase II of the same project. In this phase, we plan to conduct the same study but increase the number of subjects. In the future, we plan to explore the possibility of using Wonderland as a tool for virtual architectural critiques. You are currently browsing the Wonderblog blog archives for July, 2013.